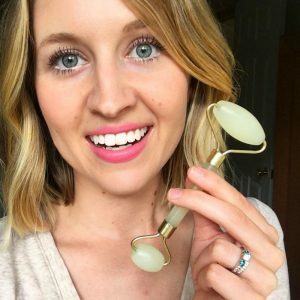 If microneedling seems scary to you, there is another way you can get glowing, youthful looking skin. 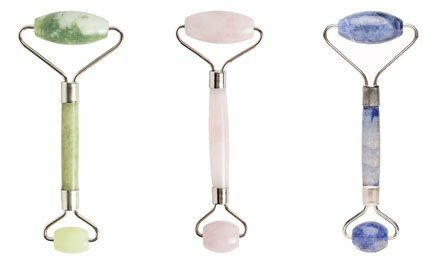 Jade rolling is an easy, inexpensive way to relieve stress in your face, depuff, roll out wrinkles, and clear out toxins. And it only takes a few minutes to do! Jade is a stone used in Chinese medicine. It cleanses and helps the body drain the lymphatic and filtration system. 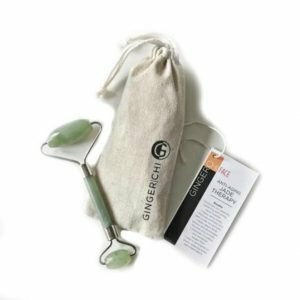 A roller is simply a tool to make it easy to glide across your face and body. Pop your roller in the freezer for a few minutes if you want to add a nice cooling sensation while rolling. I personally love doing this! Cleanse and exfoliate your face. If you’re looking for some non-toxic cleansers and exfoliators, check out My Faves page. Apply a serum, your fave face mask, or my personal favorite manuka honey face mask. Now start! Always move in the directions moving away from your face – think of it as pushing the toxins out and away. Start on your forehead in the center (with the large end of the roller) and roll slowly towards your ear. Repeat about 3-6 times in the same area and then do the other side of your forehead. You do not need to apply too much pressure, just enough that it rolls across your skin. Do the same on your cheeks, jawline, and neck. Always moving the roller in an outward direction. For your neck, move in a downward motion away from your face. Now flip the roller around to the small end and roll gently over closed eyelids and the undereye area. Starting in the corner of the eye and then towards your ear. Then roll over your nose, starting in the middle and rolling away towards your ears. This can take about two to ten minutes. Your skin should be flush afterward, but that’s how you know it’s working! When you’re done, rinse your face and apply a serum to moisturize. Drink lots of water because you are flushing toxins and will need to hydrate. Water will help with the flushing process too. 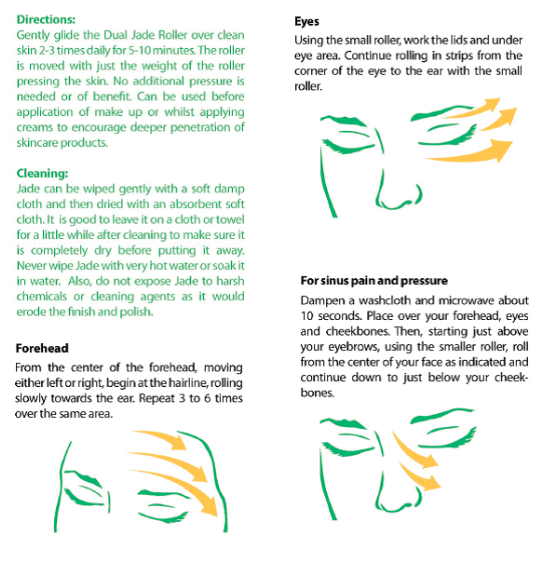 You can also use a jade roller to relieve sinus pressure by placing a warm washcloth over your face and then rolling. I did this when I had a cold and it helped tremendously. How Often Should I Roll? You really can do it as often as you’d like, but I recommend 3 or 4 times a week. Heck yeah. I love jade rolling whenever I’m feeling a little stressed because it relieves tension and feels like a little facial. It also helps to roll the day after microneedling to aid the healing process. And if you do it correctly you will be a little flush which means your circulation is kicking into high gear and the toxins are moving out! I definitely notice less puffiness under my eyes after rolling. And my face feels more toned and glowy. Plus it just feels awesome to do! Can I Only It Use On My Face? No way! You can use it all over – face, feet, neck, arms, chest, legs. Wherever you feel the need. 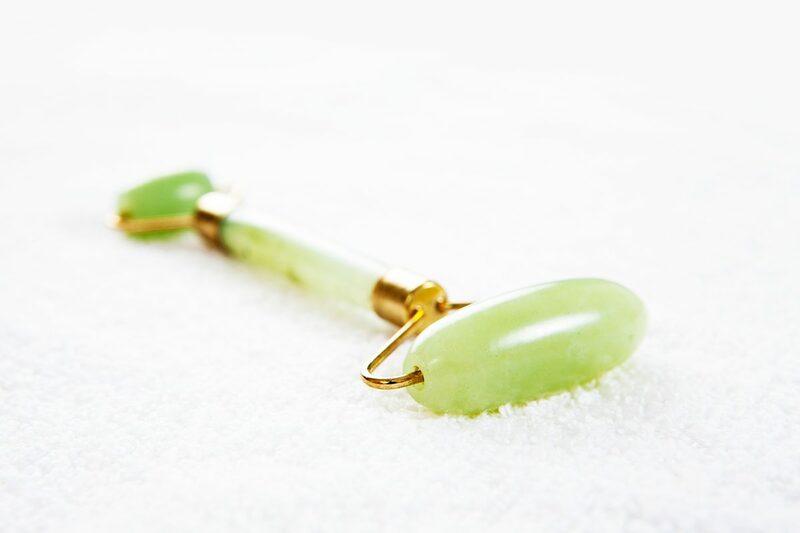 When you’re done rolling, you can gently wipe down the jade roller with a soft, damp cloth. Make sure it is completely dry before putting it away. Never use really hot water and do not soak it. Avoid using harsh chemicals or cleaners to wash your roller because they can erode the polish and finish; only use natural, gentle cleaners. I like to store mine in the freezer so it’s nice and cold whenever I need to use it. 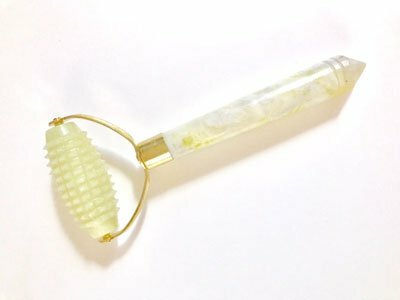 Jade rollers are becoming really popular so thankfully there are many places you can buy them and in different styles. Watch out for sites like Amazon that might have cheap knockoffs or ones that are dyed instead of actual jade. Have you tried jade rolling before, or are interested in trying? Let me know in the comments! Hopefully it’s back in stock soon! Yay! I keep mine in the freezer, on the top shelf that’s on the inside of the door. I just put it on a paper towel and make sure it’s not touching anything else!